Learn everything there is to know about Payments. Below you will find a start to finish tutorial covering everything you will need to know regarding payments in PracticePanther. Jump to the topic of interest by clicking on a title in the index below. You are able to add payments into any number of operating and trust accounts. Additionally, you can run reports on each of these bank accounts separately, giving your firm full accounting capabilities right here in PracticePanther. 1) On the top of your screen, click "More", then "Bank Accounts", and select "Manage Accounts." 2) This is your "Bank Accounts" page. You can easily see all accounts you currently have open on PracticePanther, as well as the amounts that are reconciled or not for each one. To add a new bank account, click "New Bank Account" found on the top right. 4) When you go to make a retainer payment, you will have the option to pick from any of your existing bank accounts. Not unless you Connect PracticePanther Bank Accounts to QuickBooks Online Bank Accounts. Custom bank accounts that are not matched with the QuickBooks Online bank accounts will not sync payments to QuickBooks. Do payments integrate with QuickBooks Online? Yes! All new/edited invoices and any new/edited payments get sent over to QuickBooks Online instantly. To learn more about this integration and how to set it up, check out this QuickBooks Tutorial any time. Can my clients make direct online payments on their invoices? Yes! By taking advantage of our LawPay partnership, PantherPayments, you can give your clients a "Pay Now" button on their invoices, request additional retainer payments via E-mail, and even charge a card you have in hand or on file. The best part is, we'll cover the LawPay $20 monthly fee as long as you sign up for LawPay through us on this page, and process at least $1/month. Simple! For the full rundown on how to get setup with PantherPayments today, click here! How do I add my LawPay payment page to my website? 1) Open the contact or matter you'd like to add a retainer to. Note: If the retainer is stored on the contact level, it will be usable for any matter connected to that contact. If the retainer is stored on the matter level, only that matter can use the retainer. 2) Click the green "New" button on the top right, then click "Payment". 3) Click "Add a Retainer". Charge a Card: If you are synced with LawPay here, you can charge a card you have in hand or on file directly. For more info on how to sync up to LawPay, click here. Request a Payment: If you are synced with LawPay here, you can click this to prepare and send an email containing a direct payment link to either retainer account. The payment will be sent to your bank via LawPay, and make a pitstop here on the contact/matter in PracticePanther. For more information on this feature, click here. Add a Payment: Will allow you to manually add a payment that you may have already received. 5) Click "Add a Payment". 6) Fill out the payment details. Be sure to select the appropriate bank account, date and payment method. If it's a trust retainer, it will appear in the first bubble. If it was an operating retainer/credit, it will appear in the third bubble when you hover over it as "Unapplied Amount". If you enter the payments tab of this contact/matter, you can hover over the retainer payment and click "Pay Invoice" to apply this retainer to an existing invoice. Also note, if you're synced with QuickBooks Online, this payment will be sent there automatically for you to match it up with the payment seen in your bank. The evergreen retainer is an excellent tool to help lawyers make sure they never accidentally work more than what’s available in the trust account. 2) In the bottom, find the line labeled “Evergreen Retainer”. 3) Toggle “No” to “Yes”. 4) A new line appears called “Evergreen Amount”. 5) Type an amount of dollars that you would like to receive a warning for once your trust balance for this matter reaches falls below it. You can request payment to your clients without the need of an invoice. You can even choose whether to receive the payment into your Operating or Trust account. To start, please make sure you are synced with LawPay over here. 4) Select "Add a Retainer", then click on "Request a Payment". Note: If you are not synced with LawPay here, you will not be able to request a payment. To learn how to setup LawPay with PracticePanther, click here. 1) Open an invoice you'd like to pay that you know belongs to a contact/matter with an available retainer. 2) Click "Enter Payment" found on the top or under the "Actions" button. Pro Tip: If you hover over any invoice in a list, some options will appear. Clicking "Enter Payment" this way will also work. Note: If you do not have available funds in the trust or operating account for this client, this option will not appear. 4) Decide how much of the available trust or operating funds you'd like to use, then confirm the same amount in the "Amount to Pay" field for that invoice. 5) Then click "Apply Credit(s)" on the bottom. The applied funds will appear on the invoice in the subtotal section on the bottom right as seen below. You can unapply these payments any time by simply clicking the blue garbage can next to the listed payment. Note: If you unapply a credit payment from the invoice, you will still need to delete the listed payments inside the contact/matter. 1) Click the check boxes found to the left of the payments with the "Transfer to" descriptions. 2) Click the blue gear found on top of the list, then "Delete". To apply a payment to an invoice, see the steps below. 1) Click on "New", and select "Payment". 2) Select the contact and the matter, and hit "Next". 3) Select "Pay an Invoice", and choose "Add a Payment". If have our integration with LawPay enabled, you can charge a credit card directly in PracticePanther. 4) Specify the payment method, and add the necessary notes (you can add a check number in the "Notes" field). 5) Scroll down and specify the amounts to be applied to the specific invoices. Then hit "Pay Invoice(s)". The payment will be applied to your invoice(s). If you would like to print the payment information, find and open the payment (through the payments tab). After saving the invoice, if there was available retainer you'll see the payment posted on the invoice in the "Subtotal" section immediately. Click the trash can icons anytime to remove a posted payment. 1) Click on the white "New" button at the top of the page (or on the green "New" button if you're in a contact or a matter), and select "Payment". 2) Select the contact and or matter whose money you're looking to transfer (skip this step if you used the green "New" button, as the contact and or matter will already be assigned). 4) Select the source matter, and the source account (Transfer From). Then choose the destination matter, and the destination account (Transfer To). 5) Specify the amount to be tansferred, and click "Transfer". The transferred amount has been deducted from your client's operating account (red), and deposited into the operating account (green). To use the unapplied amount to pay an invoice, hover over the payment with your mouse, and select "Pay Invoice" in the menu that pops up right under it. 1) On your invoices page, change the "Status" filter to "Due". 2) Use the top check box on the top of the list to check off all the listed invoices below. 1) Click here, or click "More" on the top, then hover over "Bank Accounts" and click "Print Checks". A button for this is also located on the "Bank Accounts" and "Payments" pages. 2) Select which account you wish to see the print queue for. Then, check off the boxes to the left of each check you wish to print. Note: If you need to purchase new checks, you can easily order new checks from QuickBooks using the "Order Checks" button any time. 3) Scroll down and enter the check number your checks in the printer are starting with. Then, select which type of checks you have, and click "Print". 4) Clicking "Print" will download a PDF to your computer (as seen below). Open the PDF, then right click anywhere on the page and click "Print". 5) Important: Make sure "Fit to page" is NOT checked. This is to insure that all text will fall into the correct spaces on the checks. 6) Insure that the correct printer is selected and click "Print". Anytime you make a cash or check payment on PracticePanther, it will be added to our "Deposit Slips" queue. This will allow your firm to print out a deposit slip and take it to the bank for all your firm's recent payments. 1) Click here, or navigate to the "Print Deposit Slips" page found on the "Bank Accounts" page. Alternatively, you can click "More" on the top of your screen, then hover over "Bank Accounts" and click "Print Deposit Slips". 2) Select which bank account you'd like to print a deposit slip for. Note: Don't have any deposit slips? No problem! Click "Order Deposit Slips" found on the top right of this page, or click here. 3) Either use the top check all box, or hand check the payments you wish to include in this deposit slip. As you check boxes, the blue gears bubble on top will update it's total so you know exactly how much you're trying to deposit before continuing. Note: Hovering over a payment will allow you to remove it from the queue, edit the payment directly, or even push the payment to QuickBooks Online if needed. 4) After all desired payments are checked, scroll to the bottom of the page and click "Print". This will download a PDF file for your deposit slip. 5) Open the PDF file. Note: If you cannot find the file, check in your computer's "Downloads" folder. 6) Review the PDF to insure all desired payments are displayed. 7) Right click anywhere on this page and click "Print". 8) Important: Insure that "Fit to page" is NOT checked. If it is, the slip will not print correctly. 9) Make sure the correct printer is chosen and the deposit slip paper is correctly loaded into it. 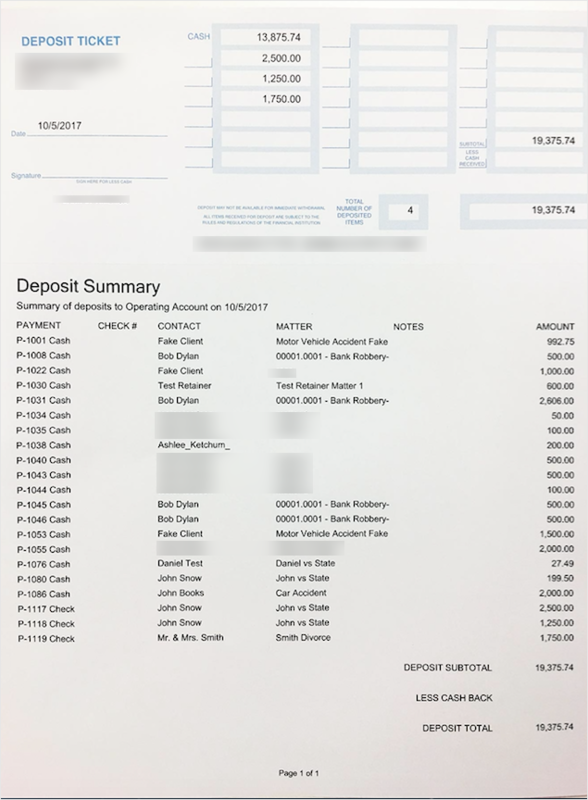 The information from the PDF should print onto the deposit slip page as seen below. This slip can then be taken to the bank along with the corresponding cash and checks so the bank teller can easily deposit your money. Click here to order deposit slips from QuickBooks directly. Click here to order deposit slips from CheckDepot. 1) Click here to go to your "Invoice Options". 2) Click "Show More Options". Sometimes your clients will forget to pay their invoices and simply need to be reminded of their outstanding balances. You can create an unlimited number of invoice payment reminders to be sent before or after the invoice due date. 1) Click your name on the top right and select "Settings". Then go to the Invoice Reminders page. 2) Click the New Payment Reminder button to create a new reminder. You can customize when the reminder will go out, and what the reminder will say each time the email is sent to a client. The reminder will include a link to the invoice. Pro-Tip: You can select the default for new invoices and clients under Invoice Options in the settings screen. If I have an invoice that was made from 1 month ago, and today I make a new payment reminder to send 5 days after due date, will the system go back to all invoices older than 5 days and send those reminders, or is it only for new invoices only? No, it will not send payment reminders unless you specifically tell it to by navigating to the invoice and turning it on manually. When PracticePanther sends that payment reminder email, will there be a note on the invoice to say "invoice payment reminder sent"? Yes, it will log an activity comment, under the contact and matter's "About" section. It doesn't log one under the invoice.